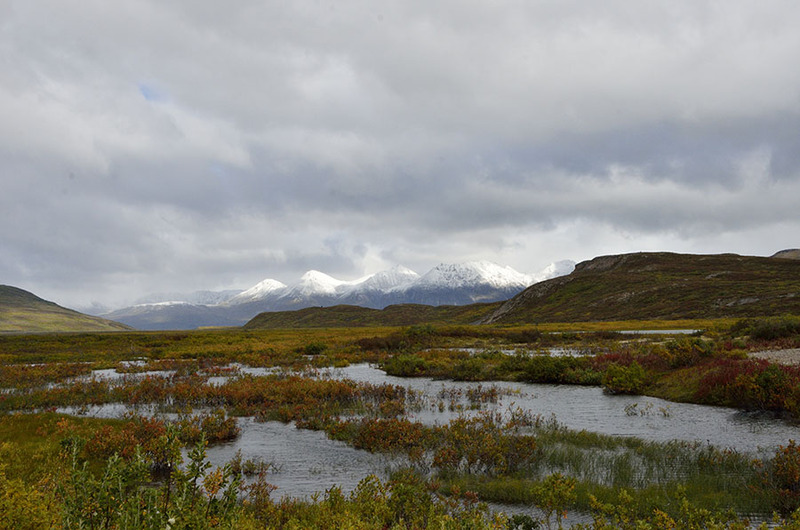 This is the first installment of tales from our September “road trip” to the Alaskan Interior. Over the course of three and a half weeks we drove 2500 miles and covered another 2000+ miles on ferries, airplanes, and a tour van. 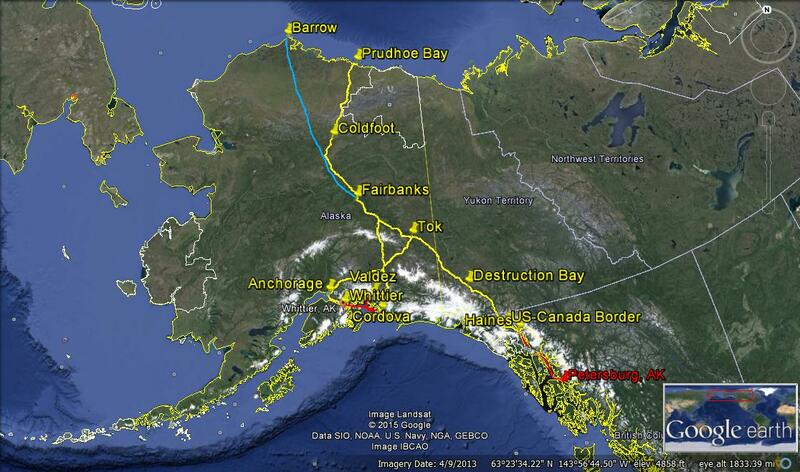 Here’s a picture of our entire route – Alaska is a very big place! (Yellow indicates road, blue indicates airplane, and red indicates ferries.) I put “road trip” in quotes since we live on an island that’s not connected to anything, so to get our car to a road that actually goes somewhere requires a boat ride first… on the Alaska Marine Highway, (aka the ferry). The ferries that serve Petersburg are 418 feet long, carry 600 passengers and up to 134 vehicles. 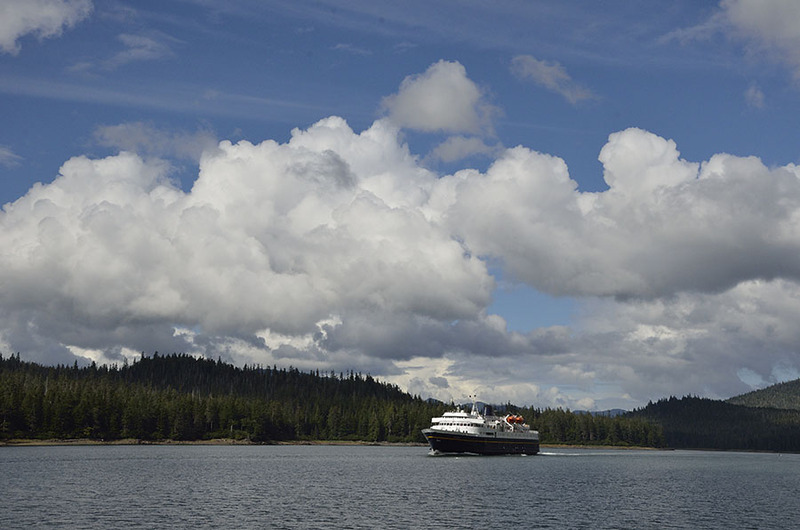 The Marine Highway is a vital service that connects the isolated communities in SE Alaska as well as Prince William Sound throughout the year, and it’s a popular way for summer tourists to get around and see more of the Inside Passage. The ferries are moving most of the time, and they’re constrained by tides in a few places so the schedule varies from day to day. You have to meet the ferry when it happens to stop in your town – which might be in the middle of the night. The ferry only stops a few times a week in Petersburg, though we were lucky that our “road trip” start date coincided with a midnight arrival of the ferry COLUMBIA. There are only two towns in all of SE Alaska with roads that actually go somewhere. Juneau, Sitka, Petersburg, Ketchikan, Wrangell, Angoon, Gustavus, Hoonah and Kake are all land-locked, so we have to take the ferry to Haines or Skagway to get to the road system. 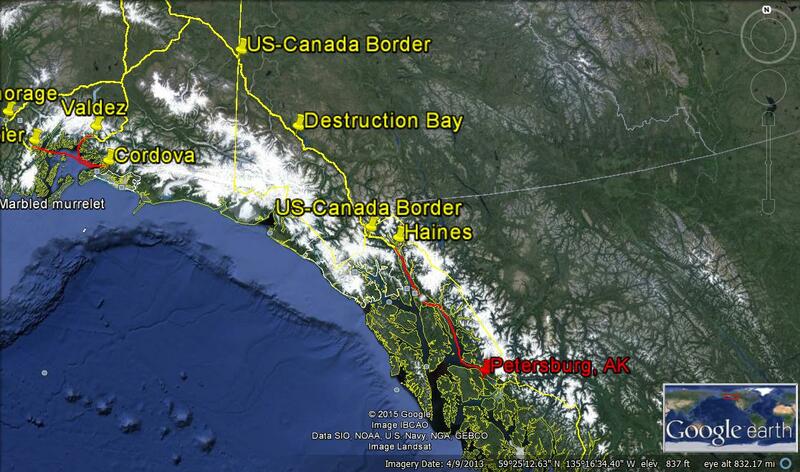 It’s interesting to note that Haines and Skagway are only 16 nautical miles apart, but they are 350 miles apart by road. If you look at a map you can see that the Canadian border is very close to Haines, and that means we have to go through two provinces in Canada (British Columbia and Yukon Territory) to get to the main part of Alaska. We arrived in Haines at a very reasonable 4pm, so we checked into a hotel and drove over to the Chilkoot River to look for bears munching on the last of the summer salmon run. We saw some eagles and could smell plenty of dead salmon, but no bears this particular afternoon. 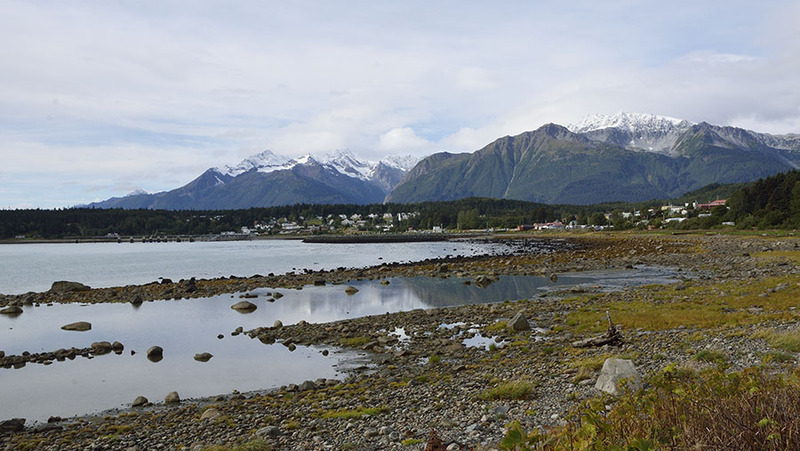 Haines is a beautiful place surrounded by tall mountains, but it gets much more snow and cold in the winter than Petersburg does. The next morning, September 1, we pointed the car north. 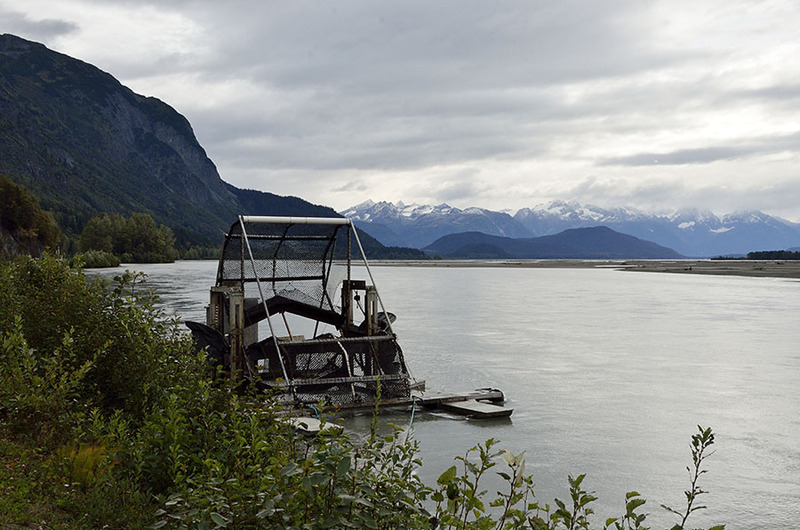 Along the Chilkat River, which plays host to the largest concentration of bald eagles through the winter (about 3000 birds), we spotted a native Alaskan fish wheel – a means of catching salmon that is only allowed in a few places since it’s such an effective mechanism and could lead to overfishing. It’s only about 40 miles up to the Canadian Border, steadily climbing and gaining altitude as we drove. The first leg in Canada is through British Columbia, and the fall color was just gorgeous! 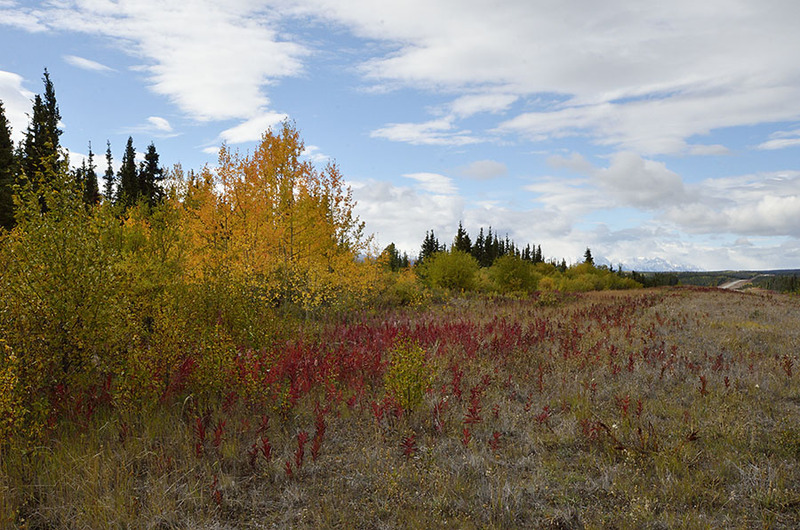 All the deciduous trees are yellow, but the only red was from the fireweed on the roadside. We miss the pretty reds and oranges we remember from the east coast. As we climbed the mountains were showing snow about 1000′ higher than we were. 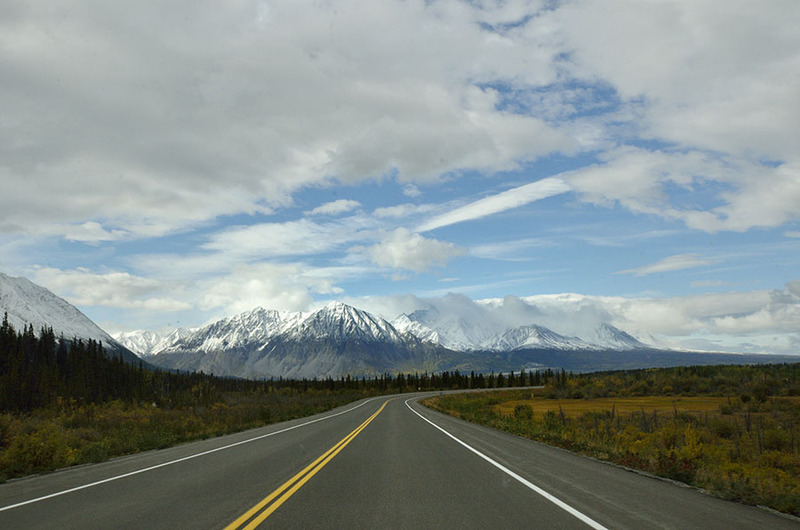 We turned right at the Canadian town of Haines Junction onto the Alaska Highway – also known by its older name, the Alcan Highway. In February 1942, shortly after the bombing of Pearl Harbor, President Roosevelt ordered the construction of an Alaska-Canada (Alcan) military highway to allow for transportation of military materiel and personnel to the relatively unguarded “back door” to the United States. American and Canadian troops built the road through rugged mountainous wilderness in only 8 months! In 1946 the road was opened to civilian traffic. My Father was in the Army in Alaska during the Korean War, and he and his buddies drove back to the Lower 48 on the Alcan. I love that I was retracing some of my Dad’s steps. Jim was a great trooper and stopped for me to take photographs often. The scenery was just so stunning at every turn, though the photographs don’t do justice to the beauty. We stopped to take a photo at this meadow, and a black bear ran across the highway just as we were pulling over to the side. We watched him run into the woods, and as we were admiring the view we spotted a grizzly bear at the far edge of the meadow. In general we didn’t see as much wildlife as we had hoped, but it was hunting season and the animals were hiding. The road was paved in many places, though it can develop potholes and heaves so it’s constantly under repair. Most stretches were through remote areas with a roadhouse every 100 miles or so. 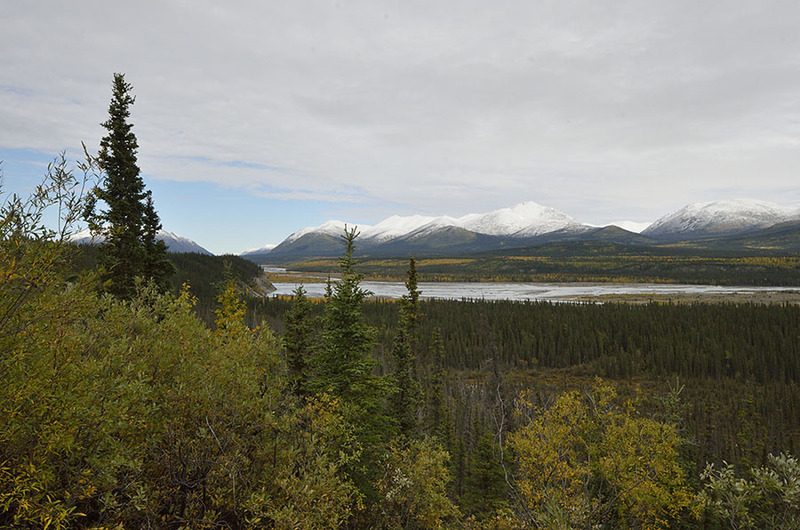 We stopped in Destruction Bay, Yukon for the first night, located in Canada’s dramatic Kluane National Park. 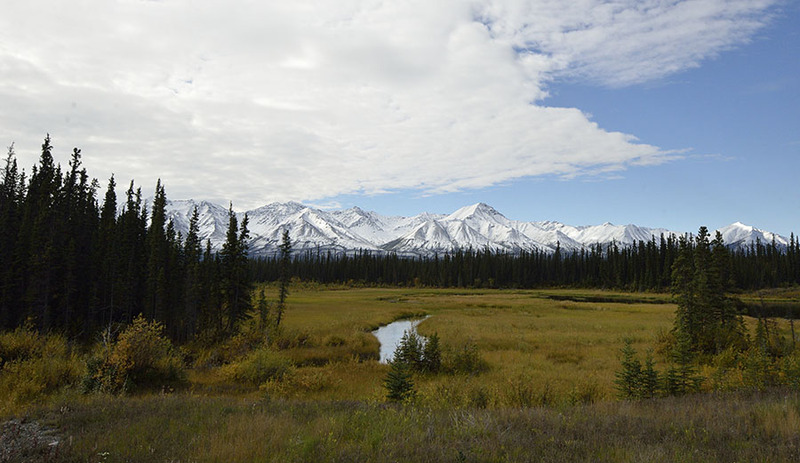 Kluane abuts a provincial park in British Columbia on one side, and it abuts the U.S. Wrangell-St. Elias National Park on the west side, creating the single largest protected land mass in the world. And we got to drive through parts of it. We’re still learning lots about life in the north country, and we learned that just because something is called a “highway” does not mean that it’s paved. 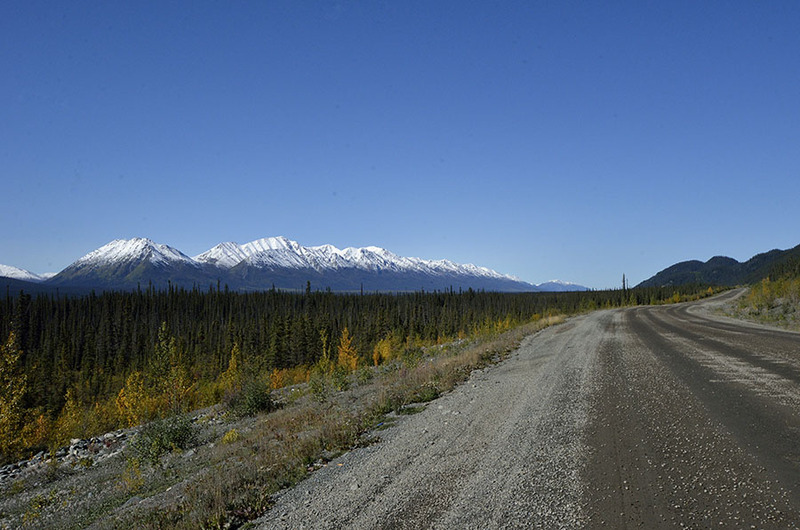 Travel on the Alcan requires attention, periodic slow travel, and a sense of adventure. 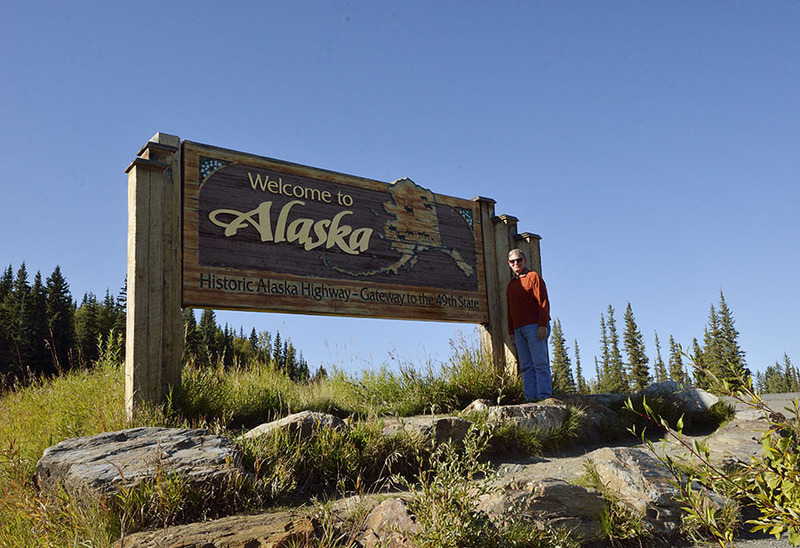 We finally made it to the Canada-Alaska border on the west side, the entry to the main part of the state. The border is funny because the Customs stations for the U.S. and Canada are about 20 miles apart, and there’s a little rest stop at the actual border where you can walk around and step between the two countries. You can see the swath of cleared land that demarcates the border, running as far as the eye can see in both directions. 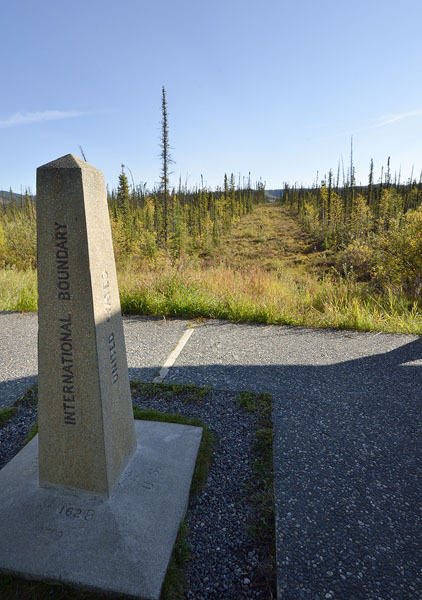 It took the International Border Commission 50 years to physically survey the entire length of the Alaska-Canada border – this is rough country! The last thought for today is to remind you how big Alaska is – it’s 2.4 times larger than Texas, and yet there are very few roads. We drove on a lot of Alasks’s roadways on this trip, but we only saw a small portion of the state. 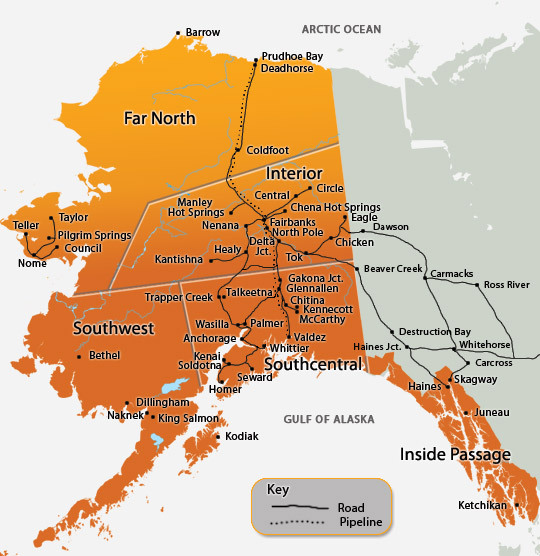 Here’s a map that shows all of Alaska’s roads (Routes 1-11). Notice how much of the state can only be accessed by air or (sometimes) by water. We’re back in Petersburg after our big road trip to the Alaskan Interior, and I’ll get you caught up with all those blog entries later on. In the meantime, I thought I’d show you a slice of life back here in the harbor in early October – a rainy time in the rainforest. 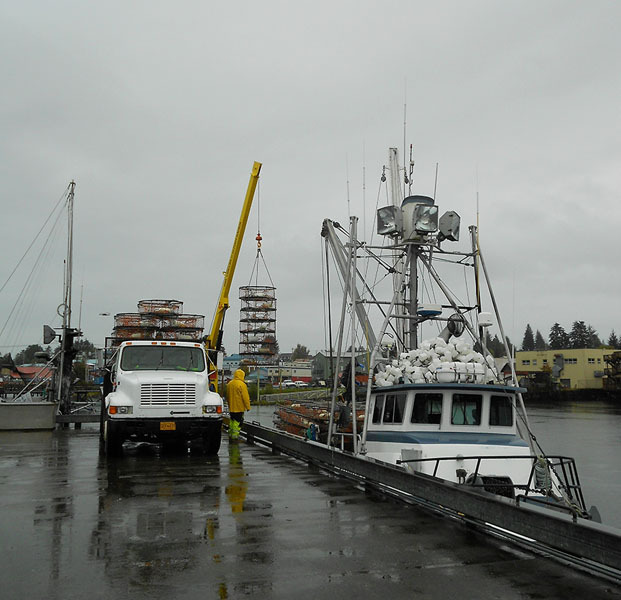 October is the start of dungeness crab season, and the crews were busy re-configuring their fishing boats from salmon gear to crabbing gear. Even on a miserable wet day the boats were lined up at the crane dock to load pots… …and the HAAKON was riding a little low in the water with so many pots! 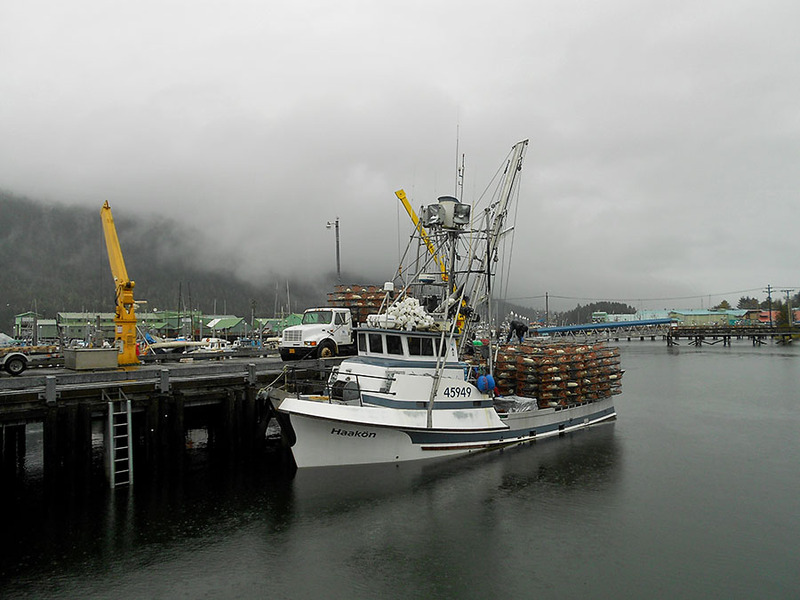 A lot of the fishing fleet chose not to go crabbing, so many of the bigger boats were back in their stalls, resting from the busy summer salmon and halibut season. We got a nice week-long break from the rain so we headed Out The Road to enjoy a picnic lunch with friends on a crisp fall day. The prospect of clear nights sent us to our computers to check the forecast for the aurora borealis, and activity for the week was predicted to be pretty good. 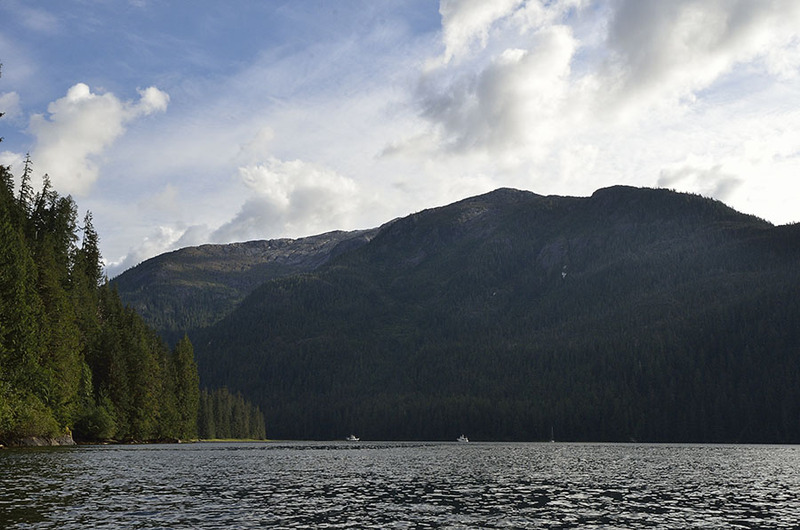 Friends called us one evening to say that the “lights are on!”, so we grabbed cameras and drove up to Hungry Point – the corner of land where Wrangell Narrows meets Frederick Sound. It’s nice and dark there, and the mountains make for a beautiful silhouette. 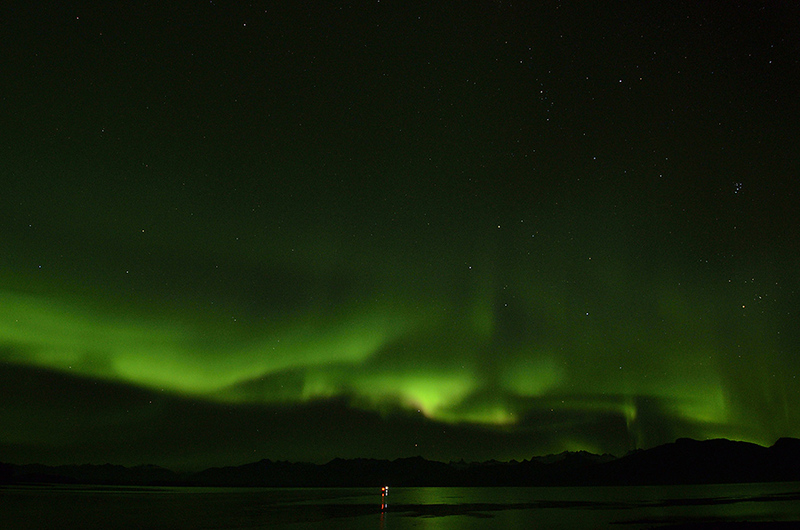 Luckily the aurora activity started quite early – around 10pm. It’s usually best seen around 1am-2am, and that means either staying up really late or setting the alarm and climbing out of a nice warm bed to go and see if the aurora is active. We usually can’t see much from the dock here – there are too many bright lights, but a short drive or walk can get us to places where we can see what’s going on in the night sky. No matter what it takes, or how cold it is, it’s really worth the effort to get to see the aurora! The aurora reflecting on the water was really pretty, and we were serenaded by the groans of the Steller sea lions that like to lay on the two lighted buoys in the foreground. What was so very interesting is that when the aurora got particularly active and bright for about 5 minutes, the sea lions also got much more vocal. 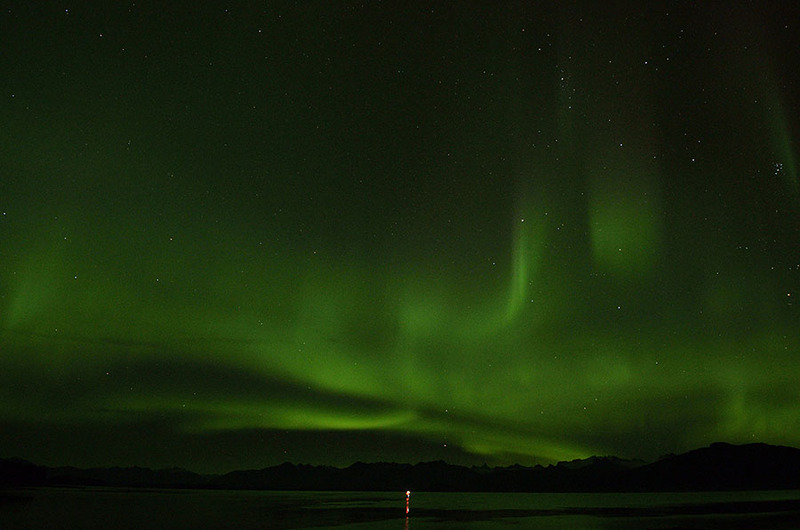 The aurora goes on much of the time, but we rarely get to see it down here in Southeast Alaska because our winter nights are so often overcast, and the aurora activity doesn’t always swing as far south as we are. Green is the most common color to see, but red and purple and white can occur too. In the photo above you can see some red on the bottom of some swirls. 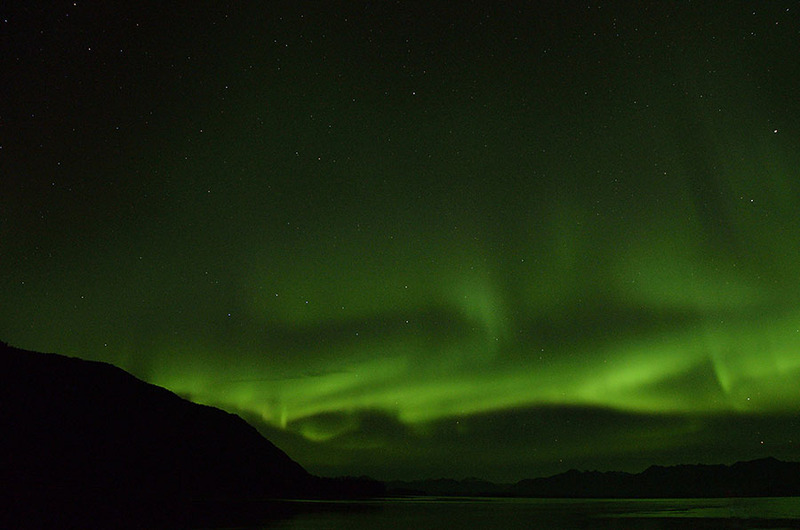 The aurora can come and go through the night, with just a pale green glow that can brighten and start dancing and undulating, sometimes forming curtains that gently sway or swirls or bands of color. Just watching it move and shift is magical. Sleepiness and cold are quickly forgotten when the skies put on their show! We spent a few days walking around like zombies from lack of sleep, and although we were sad to see the cloudy-rainy weather return at least it meant that we could get some rest. We had a lot of things to do to get ready for winter, and one thing on the list was to get in the 48 degree water and replace a few zincs on the boat. 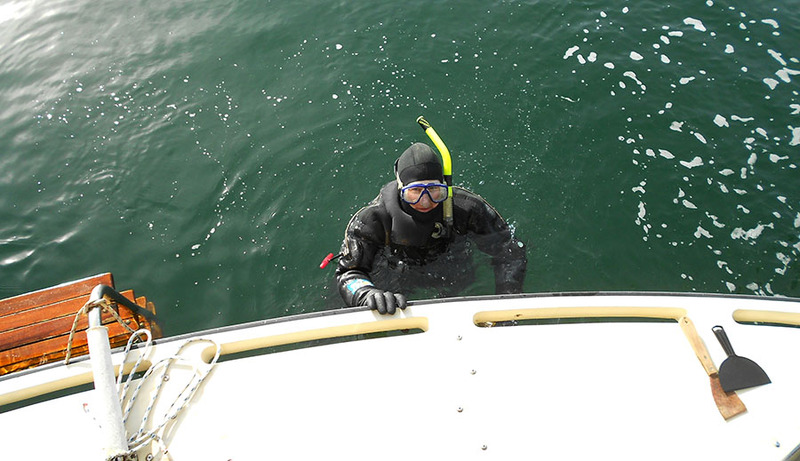 We have good dry suits and warm gloves to handle the water temperature, but the job was made a little more interesting because of the Steller sea lions. “A Toyota truck with fins and teeth” is how one diver describes them. They can cause problems and harass divers, and I’d rather not experience harassment from a 2000 lb. animal. Normally we only see them in the harbor now and then, but they hang around the canneries and fishing boats in the busy summer season. 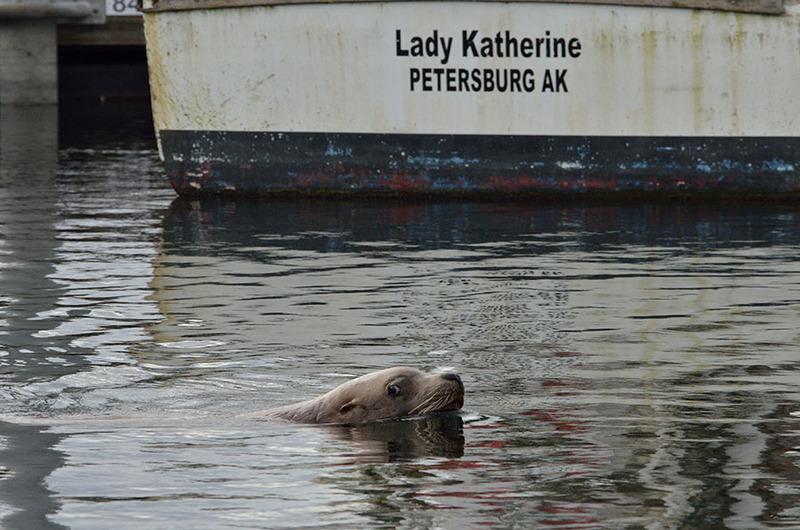 The canneries have quieted down, but the big sea lions are still around the boats quite often. The zincs needed changing, so we decided that one of us would go in the water and the other would serve as a lookout. Guess who won the job to get wet? I was just getting started on one of the zincs, trying not to drop the wrench or the nuts when Jim pounded on the swim ladder to get my attention. I popped up and quickly climbed up the ladder as far as I could in the bulky suit… with my feet still hanging in the water. 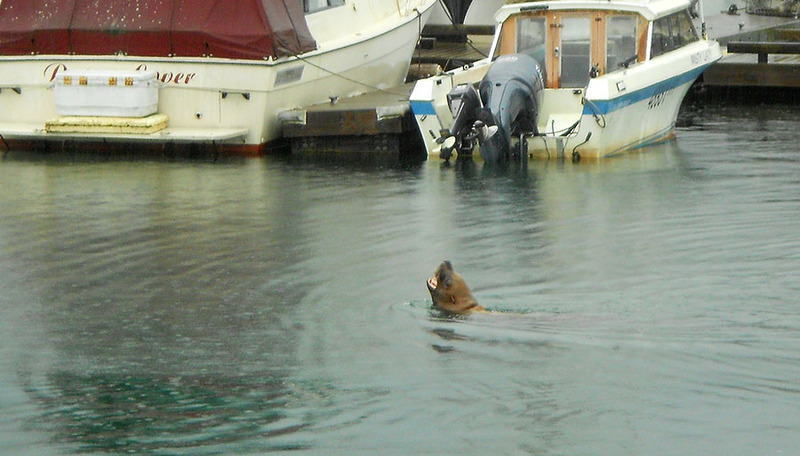 Fortunately the sea lion didn’t pay any attention to us, and as soon as he left the area I slid back in the water to finish the job as quickly as I could. I had one more Steller alert in the middle of the job, but once again he ignored us and eventually swam away. Nothing like a little excitement to make you forget the chilly water! 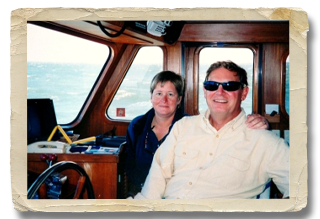 We’re back from traveling and now I have the chance to catch up on photos and posts – and the final leg of our boat cruising season is next up. 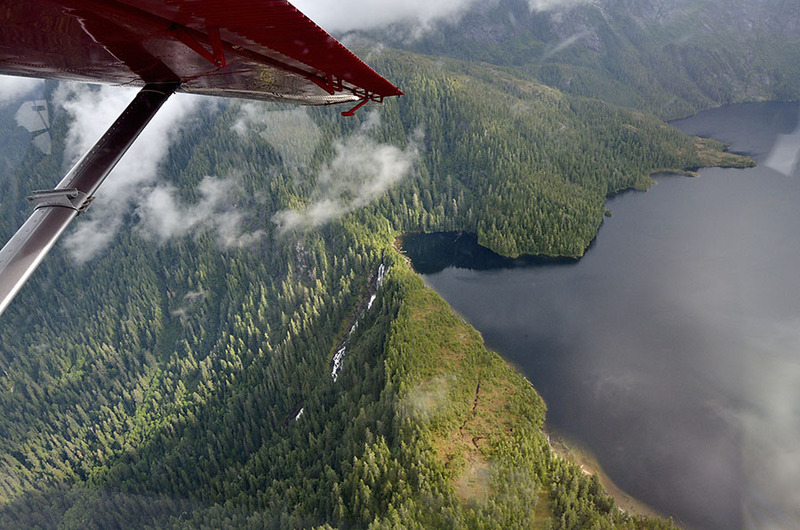 The last post was about Ketchikan and some of the native culture, and this post will be about the 2.3 million acres of the Misty Fiords National Monument, a short distance away. 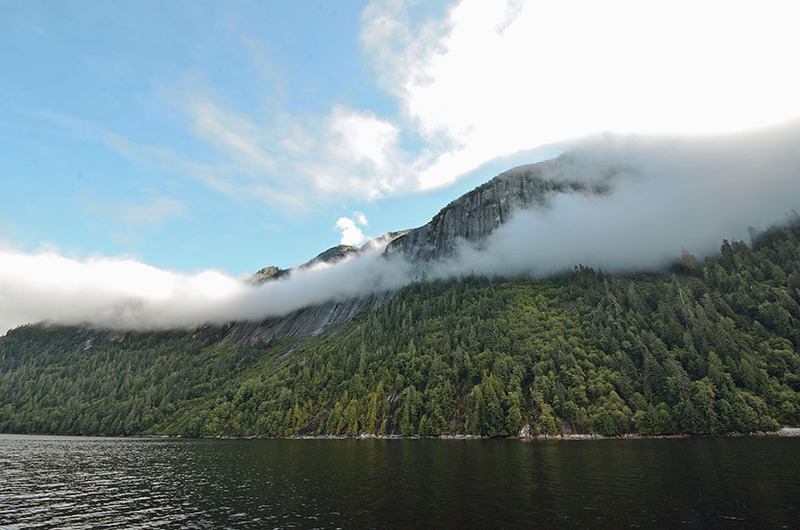 Misty Fiords is located on Behm Canal, which separates Revillagigedo Island (where Ketchikan is) from the mainland. It consists of 50 million year old granite that has been carved and shaped by glaciers, with mountains 2000-3000 feet tall that plunge vertically into the sea, which is 1000 feet deep. It is a very beautiful and magical place, and we wanted to see it by air as well as by boat. 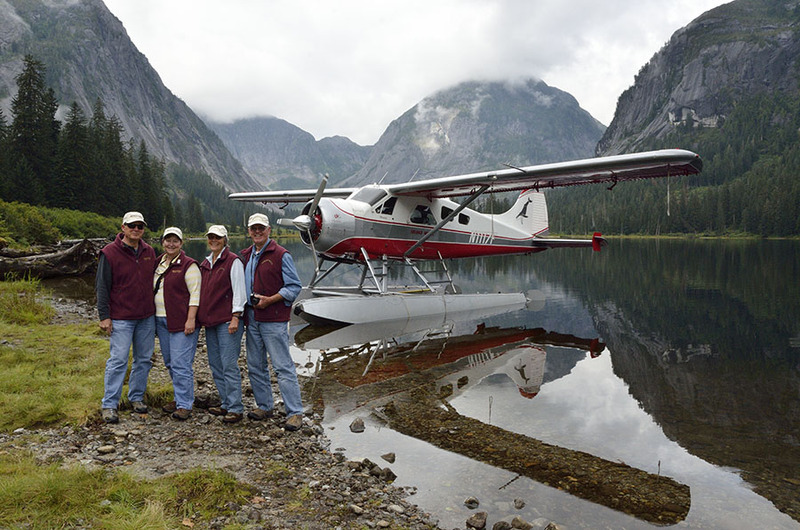 Before friends Bill and Mary flew home, we all hopped aboard Island Wings’ deHavilland Beaver floatplane for an aerial view. There are thousands of mountain lakes high up among the peaks, often draining down the sheer walls in dramatic waterfalls. We made a landing on one of the mountain lakes, and the call of a loon was the only sound we heard. Stunning. No matter how long the flightseeing trip is, it’s never long enough. 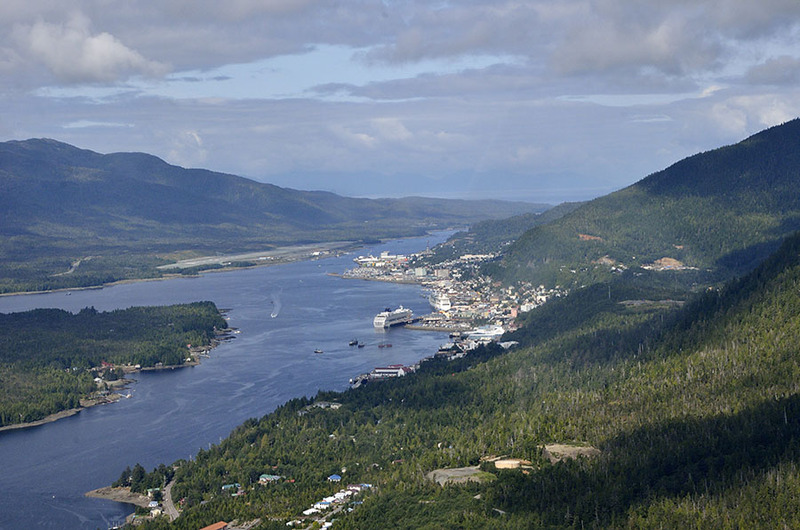 Heading back towards Ketchikan we spotted a purse seiner fishing for salmon… …and as we approached Ketchikan we had a great view looking north up the Tongass Narrows, with town on the right, the airport on the left, and a few cruise ships still in port. 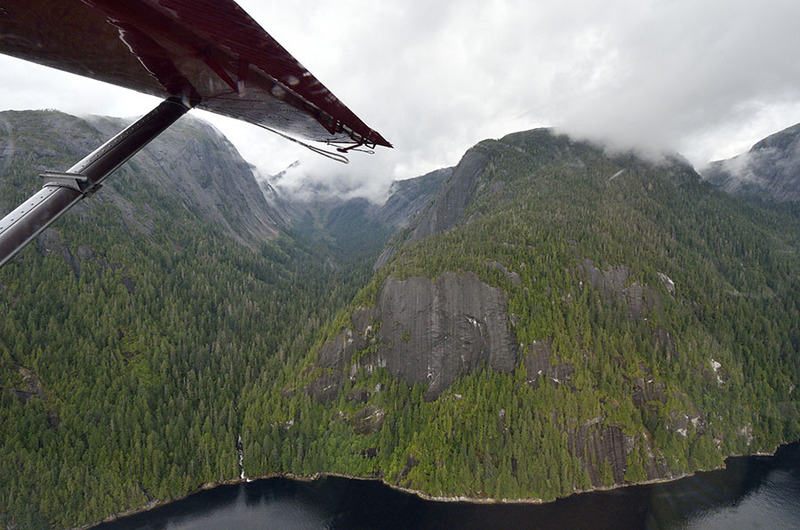 The only way to experience this remote wilderness is by boat or by float plane, and we intended to do both, despite the fact that the sheer rock faces and very deep water makes anchoring a daunting prospect. 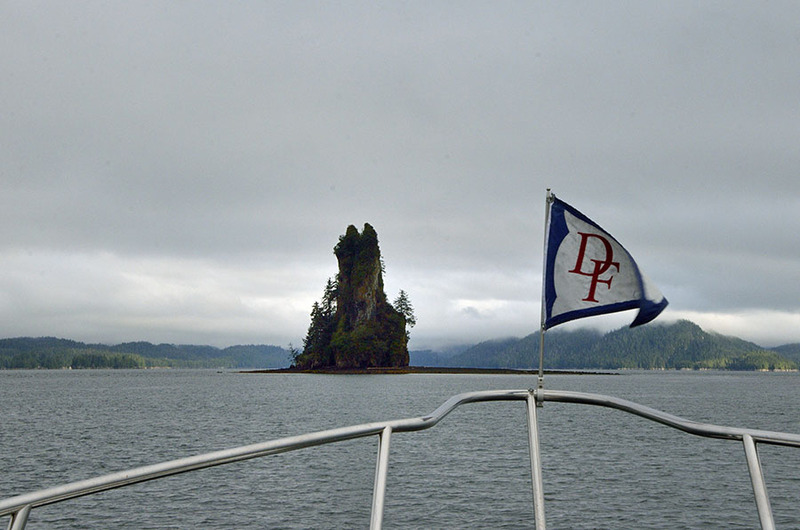 We didn’t have as much time as we would have liked, but any time spent in the Fiords Monument is worth it. 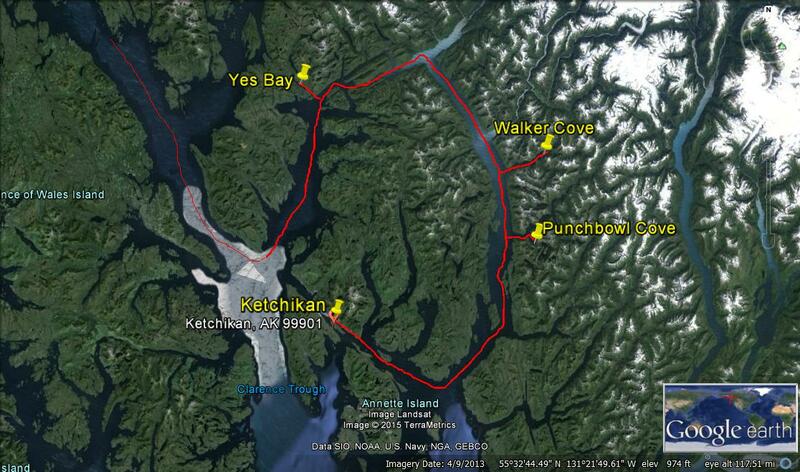 We cruised south from Ketchikan to get to the bottom of Behm Canal, and turned up into the fjord system. Our first highlight was seeing the tall spire of New Eddystone Rock – 237′ of basalt pillar left behind from a volcanic vent. This land was shaped by fire as well as ice. The rock doesn’t look that big when you’re heading towards it, but when you look with binoculars you notice the little specks on the beach that are seals, and you realize that you’ve been approaching it for a long time and it still looks so far away. 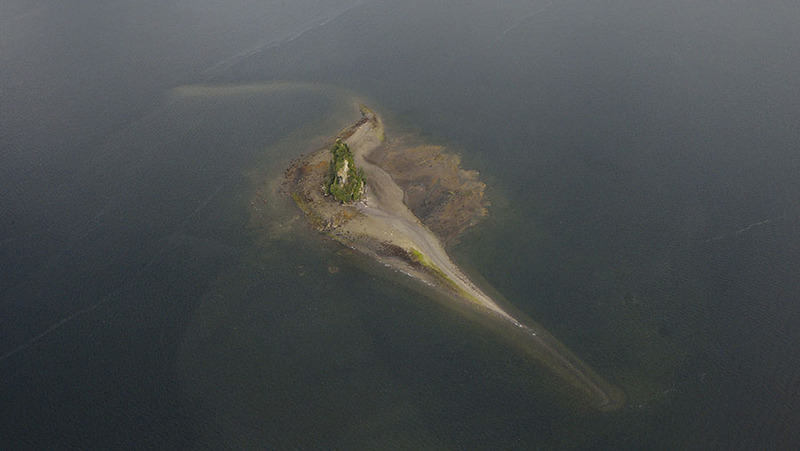 This is what it looks like from the air, and it’s odd to find this tower and shallows around it in such deep water. It’s one of the few accessible places for seals to haul out and rest in the area. Turning east past the spire we entered Punchbowl Cove – gorgeous. Clouds hung below the mountaintops, and we just slowed down to savor the view. If we had more time we would have stayed there for a few days on the single Forest Service mooring ball – the hike up to Punchbowl Lake has legendary views. Next time. 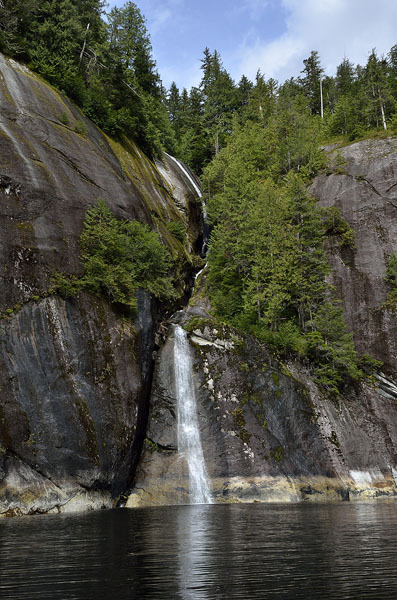 Next we headed into Walker Cove, a particularly pretty area with waterfalls of every shape and size. 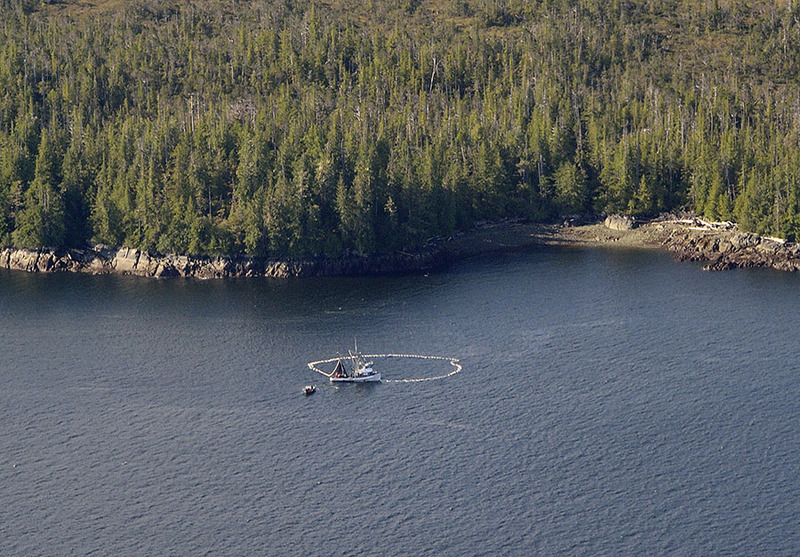 We were able to anchor just off a small meadow, watching a bear prowl the shoreline. It’s a place where you can feel very very small. 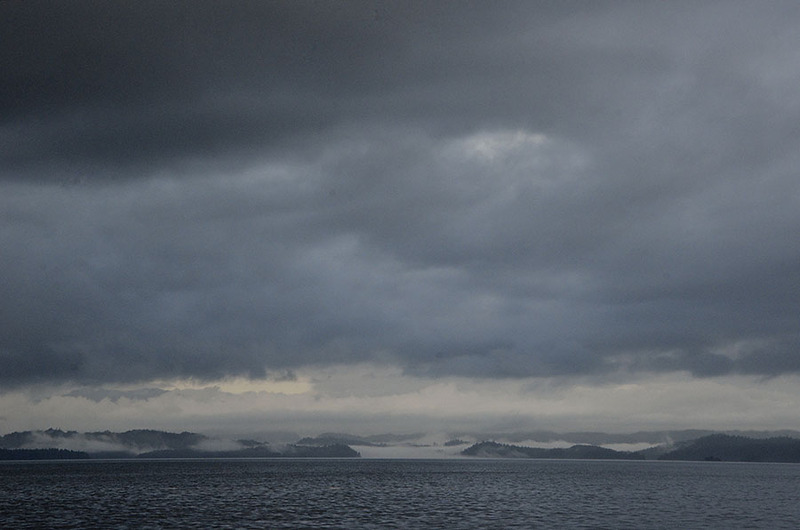 Can you spot the three boats in this photo? There are two DeFever 49s and a sailboat. 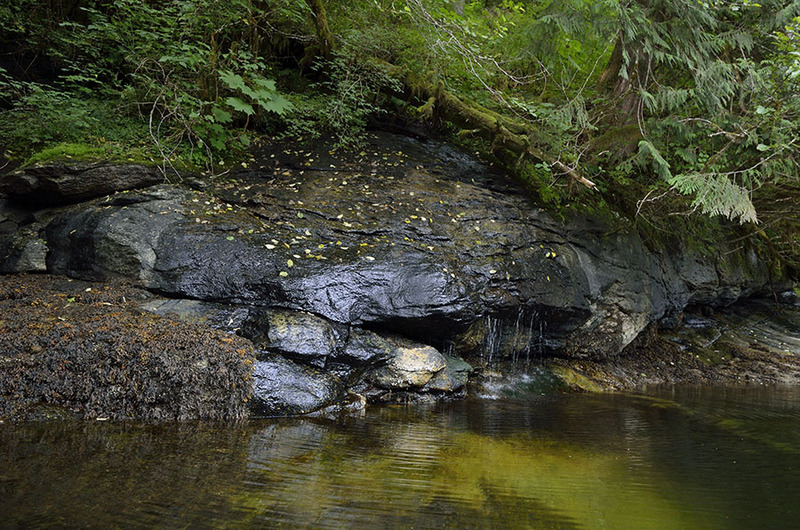 I spent hours paddling around the cove, investigating as many of the waterfalls as I could find… these are just a few of them. We really had to cut our exploration of the Fiords short, and we were sad to leave after just a couple of days, but we’ll definitely return. As we headed out for the last day the weather turned gloomy and the monument really lived up to its name. 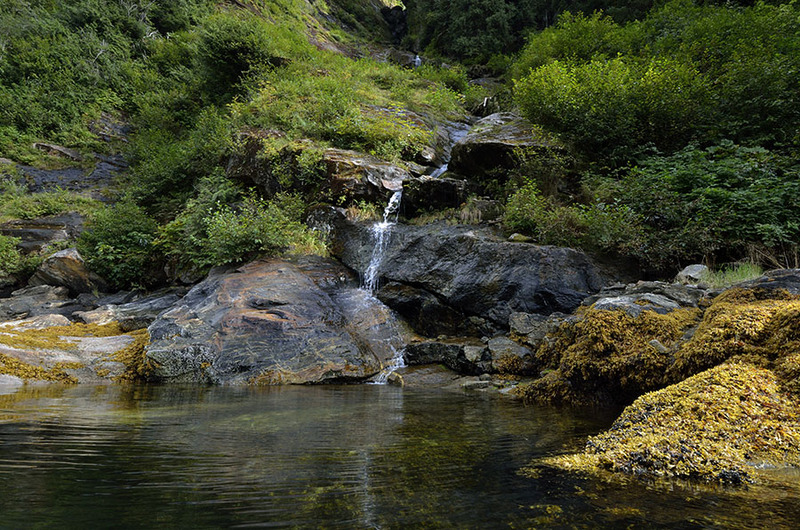 Our hurry to return to Petersburg had a good reason – another kind of adventure – a road trip to the Alaskan Interior. On the way home we were treated to humpbacks, orcas, sea lions, seals, eagles, sea otters… and a rainbow. Not a bad way to wrap up a boating season.